Good Grief! A 30 Point Deer! Shot with a Handmade Long Bow! While trolling thru some of my favorite forums, I found this. Prairie State Outdoors forums are active and interesting. Shot with a Handmade Long Bow! 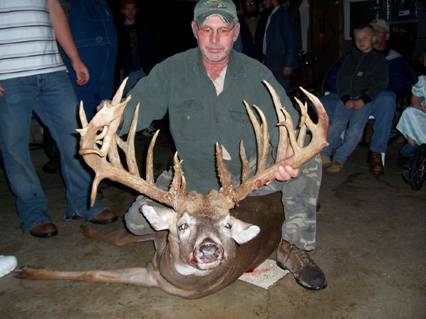 “This buck was taken by a 14 year old Amish boy near Dalton WI. He used a hand-made long bow and made the killing shot by stalking the huge buck using corn shocks for cover. The boy’s family would not allow him to pose with the trophy animal for pictures so a nearby neighbor, Willie Flacid posed and is also acting as spokesman for the Amish boy. Good Grief! A 30 Point Deer!